It's been half a year since the detective work began in earnest to identify when and where my 4th great-grandfather Burr Zelah Dornon died and was buried. Collaboration with distant Dornon cousins has helped to crowdsource ideas and facts that slowly chisel new cracks into this brick wall. 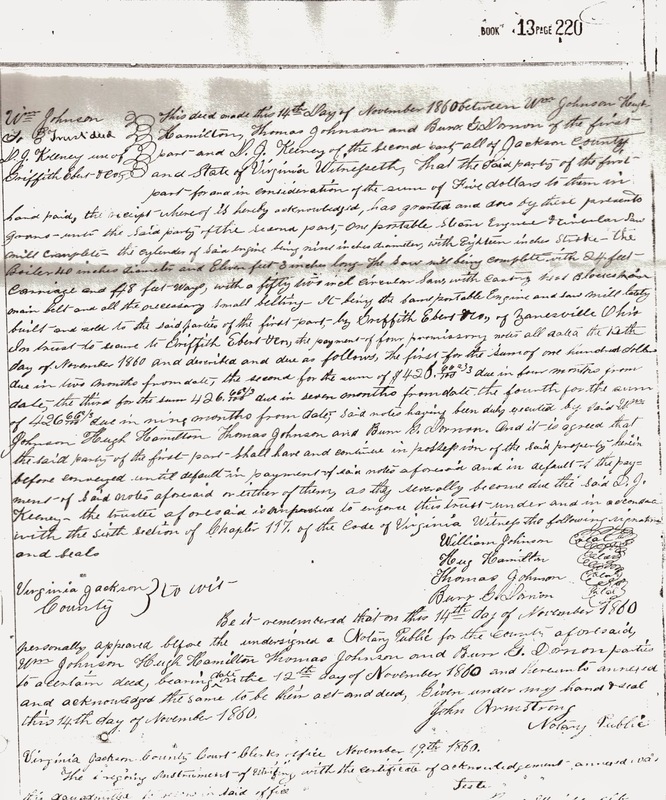 Our collective efforts have been immensely helpful in turning up land records and deeds of sale that help pinpoint Burr's whereabouts and establish a timeline for his final years. Before I fly to Salt Lake City for the 2015 RootsTech + Federation of Genealogical Societies conference, I want to step back and assess where we stand. What have we learned in the past six months, what questions remain, and what can we now hypothesize? I want to have questions in hand to explore while in Utah. Over the past six months, the questions have evolved and the research angles have shifted as new information came to light. Stone Broke: In my first blog post kicking off the search, I came across a death date for Burr of October 15, 1867. It's in tons of public online family trees. But none of them provide documentation or back-up to substantiate this date. Someone entered it into a tree and it's since been replicated so many times it's gained the weight of authority. This random death date gives new meaning to the old line from One Flew Over the Cuckoo's Nest: "...it's the truth even if didn't happen." Well, it didn't happen! In subsequent posts, we've been able to confirm that Burr is in fact deceased before October 1867. In this same blog post, we were also able to find an 1860 U.S. Federal Census confirming that Burr was very much alive in Jackson County, Virginia (soon to be West Virginia). That census was enumerated on July 7, 1860. We know for certain he's alive on that date in that location. Running From the Rebels: The second blog post took the research to the National Archives in Washington, DC. I was able to pull Civil War pension files for two of Burr's sons: Lorenzo and Andrew. Lorenzo's pension provided no clues about his father's death; however, Andrew's file hinted at the turmoil the Civil War inflicted on the Dornon family. During Andrew's application for a pension, the U.S. Government asked him to provide proof of birth. Appropriate documentation, they said, could come from the family bible. 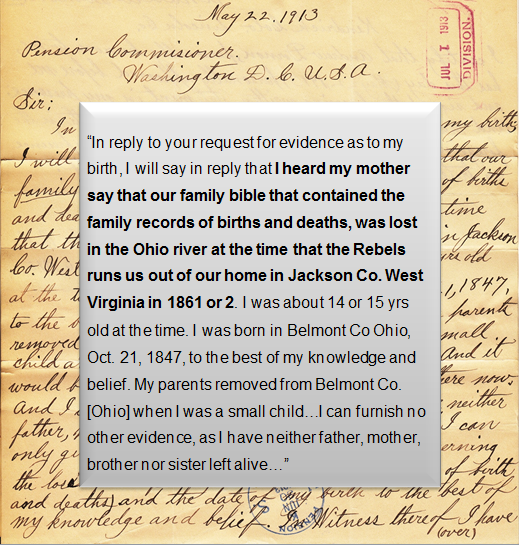 Andrew wrote a letter explaining that he had no written proof because he, "heard my mother say that our family bible that contained the family records of births and deaths, was lost in the Ohio River at the time that the Rebels runs us out of our home in Jackson Co. West Virginia in 1861 or 2." The Dornons fled their home in Jackson County because of the Rebels! Now doesn't that make you very curious about what happened to the Dornon patriarch? Research on the Jackson County Historical Society's website was able to corroborate this story. While the county was primarily under Union authority, "The only exception was in September 1862 when Confederate forces, under the command of General Albert Gallatin Jenkins, briefly gained control of the county." I speculate that Burr was still alive in September 1862 when his family fled from Jackson County to Ohio. Finding Clues in Land Records: In October 2014, a Dornon cousin that I met through the Ancestry.com online member community, shared with me a handful of land records that she was able to uncover at the Briggs Lawrence County Library in Ironton, Ohio. This cousin brought my attention to the marriage record for my own 3rd great-grandparents - Albert Benedick and Anna Dornon. Anna was a daughter of Burr. 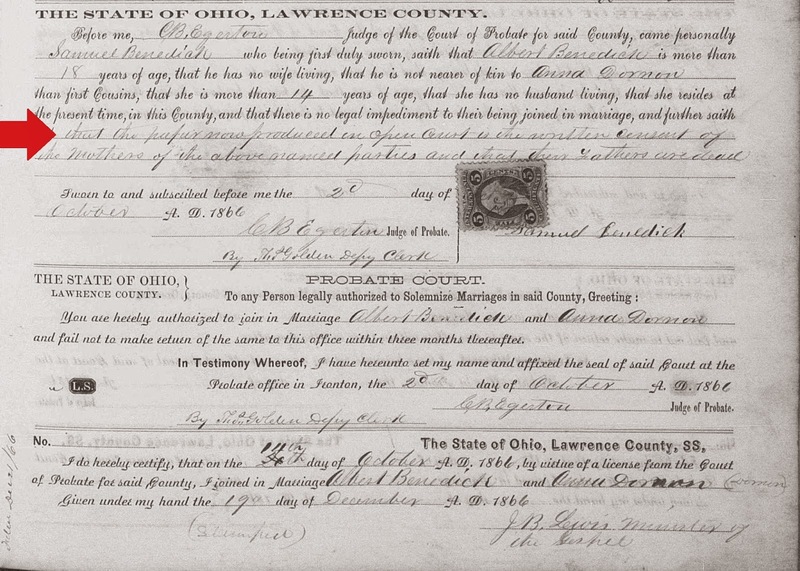 Albert and Anna obtained a marriage license in Lawrence County, Ohio on October 20, 1866. The marriage record states that the young couple obtained the "consent of the mothers ... and that their fathers are dead." Dead! There you have it! This is the first documented evidence of Burr's death. He is deceased by the time of Anna's marriage on October 20, 1866. This provides the evidence needed to undermine the erroneous death date plugged into so many online family trees. I believe the land records further narrow the window for when Burr died. In 1856, Burr bought over 100 acres of land in Lawrence County, Ohio. On June 3, 1863, two of Burr's children - Mary Susan and Joseph - sell a portion of this same land to their older brother Albert. I speculate that Burr has died by June 3, 1863, his property was inherited by his family, and two of his children sell their stakes in the land to the eldest son, Albert, who is likely administering his father's estate. Lost Lucinda: Like Father Like Daughter: Unable to locate a probate record for Burr, I decided to take a closer look at each of his children. Perhaps an obituary for one of them would provide new information about Burr's death. Burr had nine children. I was able to trace six of them through the rest of their lives. Three remained a question. The two eldest sons - Albert and Joseph - both disappear after the above-mentioned 1863 land records, and haven't been found in the 1870 census. I speculate they both died before 1870 (you'll find online family trees giving each brother an unsubstantiated death year of 1864). The youngest Dornon child, Lucinda, is also a bit of a mystery. When and where she passed away is still unknown. She married Sylvester Scannel when she was 15 years old. In 1893, Sylvester was killed in a prairie fire. 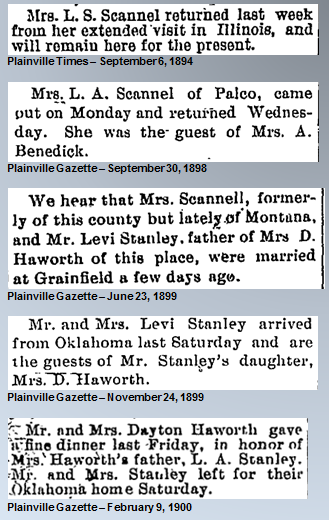 Written records of Lucinda's whereabouts become spotty after this time, until the society page of a Kansas newspaper highlights that she remarried to Levi Stanley in June 1899. They appear in the 1900 U.S. Federal Census in Woods County, Oklahoma. The trail then runs cold. The hope is that an obituary may include that crucial line, "Lucinda was pre-deceased by her parents in...[insert year]." It's a long shot, I realize, but perhaps my genealogy dreams could one day come true. This week, a staffer with the Jackson County Historical Society in West Virginia found Burr Dornon listed on a deed of trust for a sawmill. The record was executed on November 14, 1860. Burr was alive on that date and still in Jackson County. 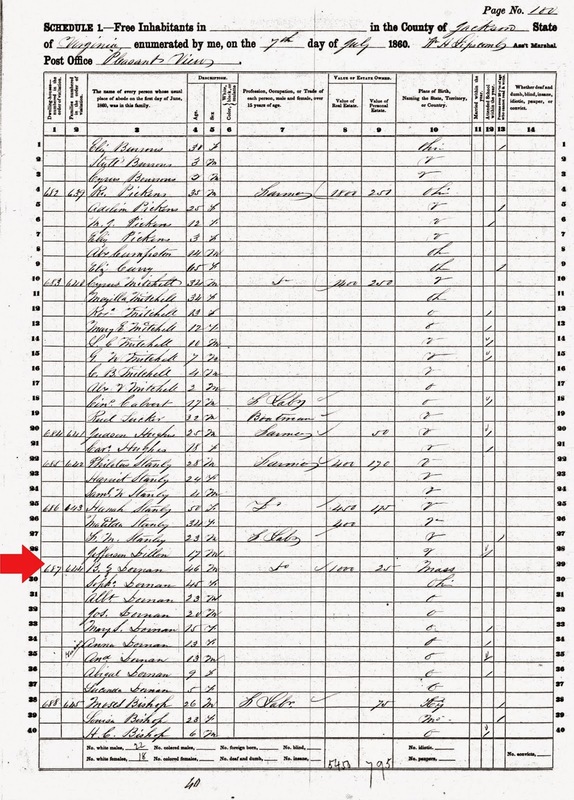 This further narrows the window from the July 7, 1860 U.S. Federal Census - his last documented appearance. 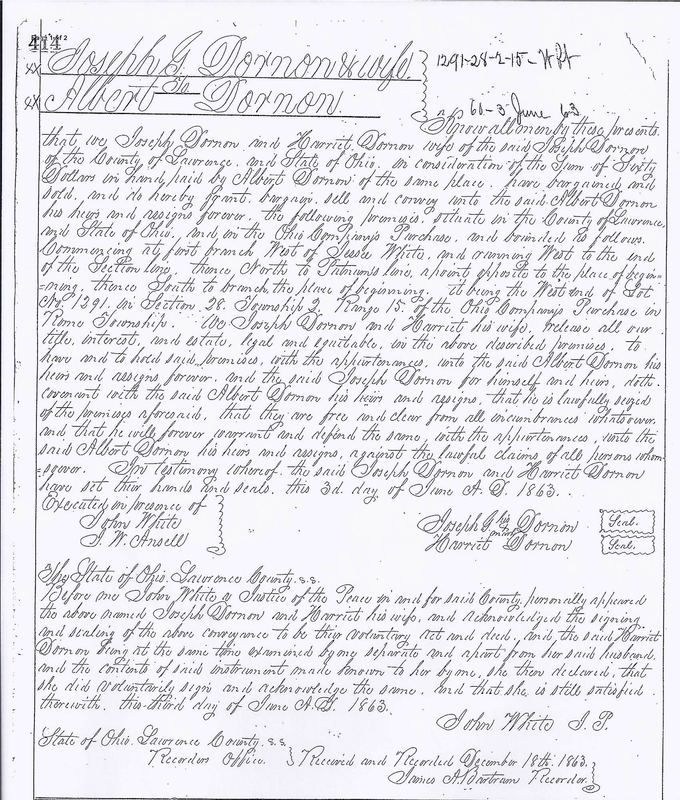 We know that Burr Zelah Dornon was alive on November 14, 1860 when he appeared in the deed of trust for a sawmill in Jackson County, Virginia. I speculate that he was still alive in September 1862 when the Confederates briefly gained control of Jackson County, Virginia, and his son Andrew wrote that the family fled the Rebels and settled in Ohio. We know that he is dead by the time his daughter Anna marries on October 20, 1866. I speculate that he was dead by June 3, 1863 when two of his children sell portions of land that he had purchased years earlier. I believe the evidence we've uncovered enables us to make a compelling case that Burr died during a nine month window. This is a curious brick wall because the questions at hand - when and where did Burr die and where was he buried - aren't key to moving further along the Dornon family line. We already know his parents' names. 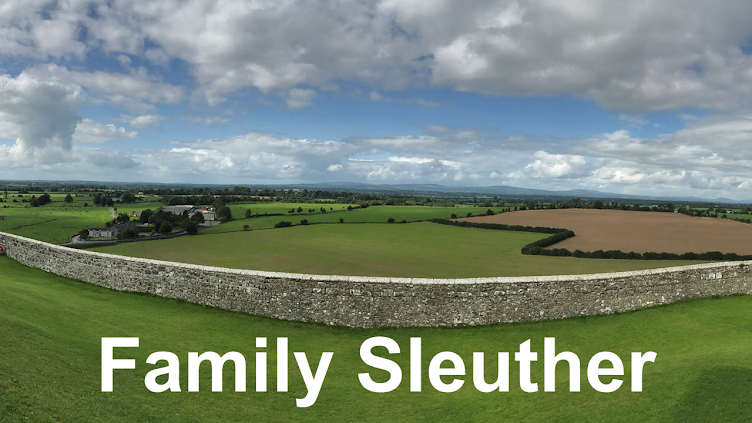 We could simply bypass the roadblock and go around the wall to continue tracing the Dornon family's ancestry. I want to find an answer to provide proof and counter the proliferation of incorrect information online (which this post has already done!). But, most importantly, I'm drawn to the human drama that appears to have unfolded during the height of our country's Civil War. Burr's family had to flee their home during a tumultuous conflict that ravaged the country. A family bible - presumably among their most sacred possessions - was tossed into the Ohio River by an invading army. Clearly, facts like this suggest there's a story there, and I long to resurrect it. This is larger than just the Dornon family and one man's death. It illustrates the hardships that war inflicted on everyday citizens; it's American history. I hold out hope that there's a government or family record that will surface and resolve these questions. Perhaps a probate record will one day surface for Burr. That would be marvelous. My distant Dornon cousin from Ancestry.com wrote last month that the Lawrence County library only has tax records for 1818 and 1821. Apparently, the records for the 1860s were destroyed in a fire. Just our luck. 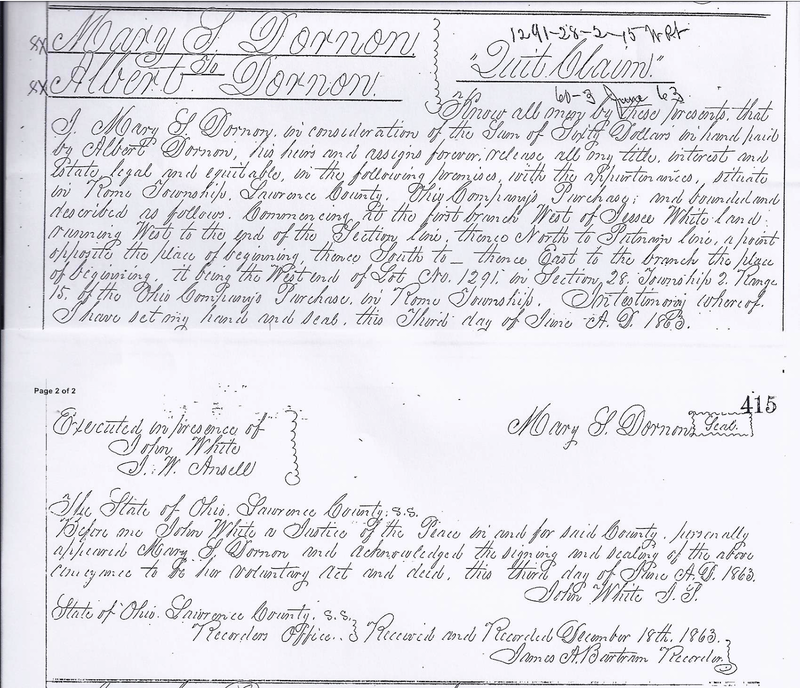 Another Dornon cousin - also found through the member community on Ancestry.com - advised that we begin looking into the family of Burr's brother Samuel Dornon. More to come on this front. Along with the deed of trust, the Jackson County Historical Society also discovered information about the widow of Burr's son Joseph. Perhaps further investigation on this front will yield additional clues. Over the past six months, this blog has helped to shed light on the events surrounding Burr's final days. I suspect this blog - and the crowdsourced research contributed to it - will be key in finally resolving our questions. Perhaps the right person will come across this post and realize they hold the missing piece of the puzzle. My mother Nellie Dillon was a daughter of William Flem, son of Lorenzo, son of Burr Dornon. William Flem and Lorenzo are both buried on Dornon land at Scottown, Lawrence County, Ohio where I live. William Flem Dornon has one daughter still living. Thanks for sharing, William. I wonder if William Flem's daughter recalls anything being said in the family about the circumstances of Burr's death, or where he's buried (perhaps also on the Dornon land in Scottown)? Do you have a connection to Joseph Dornon son of Samuel and Celia Huntsman Dornon? I believe Joseph had a brother Mark and at least one sister? Thanks. I currently believe that Samuel Dornon was Burr's brother, so Joseph would be Burr's nephew. Do you have any detailed information on Samuel Dornon, such as his wife, or wives, children,other family, residence, pictures, date and place of death, buriel, etc. I think he was born in Washington County, Ohio and he was an adult around 1915. I have been trying to find information on him to no avail. I believe his sister was married to a Ward. Her name may have been Sarah Elizabeth? Do you know the parents' names for your Samuel Dornon? If he was an adult in 1915, then he's a bit later than the Samuel who was brother to Burr.